Note: the spire was never completed. "Historic Monumental marks the site where stood in 1811 the old Richmond Theatre. On the night after Christmas in that year, during the enactment of "The Bleeding Nun," the cry of "Fire" startled all ears; the theatre was laid in ashes and three score and twelve citizens of the Metropolis, including the Governor of the Commonwealth, perished in the flames. The Municipality, cooperating with a committee of citizens, with Chief justice John Marshall as Chairman, decreed that as a proper monument of the dread disaster, a solemn temple be raised "to be forever devoted to the sacred purposes of divine worship." Thus the Monumental, with its unique architecture and vaulted dome, sprung into existence and today, with its beautiful frescoes, its grand organ and memorial windows and tablets to departed rectors and vestrymen, and its superb chancel and choir, stands unrivaled among church edifices in the Old Dominion. "His first Episcopal Act was the consecration on Nov. 10, 1814, of this sacred fane, under whose portico lie the remains of those who perished by fire, over which is erected a marble memorial with their names inscribed thereon. Within its hallowed precincts he ministered "to the best and noblest of the people; great statesmen, learned and just judges, professional men, scientists, historians and poets, swayed by his witchery of voice and magic power of action, oft worshiped 'neath its lofty dome." Lafayette, friend of the young republic, worshipped there in 1824 and heard a blessing asked for himself and family." 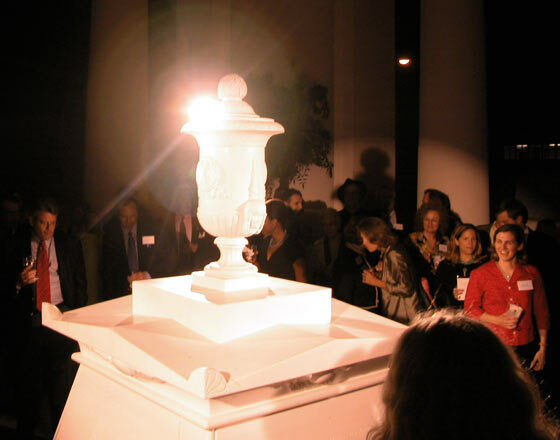 For more information on this monument to the victims of the Richmond Theater fire, click here. "The Monumental Church of the city of Richmond was consecrated on Sunday last, by the Right Rev. Richard Channing Moore, with the usual solemn ceremonies, and a discourse was delivered appropriate to the occassion." The following quote about Bishop Moore's role as rector of Monumental Church is taken from History and Reminiscences of the Monumental Church, pp. 144-145 and also The Life and Character of Bishop Moore of Virginia, Written in 1841, Just After His Death, pp.18-19. "But it is in his parochial character as the rector of the Monumental Church congregation that he is best known and most beloved in Richmond. His pastoral labors here for twenty-seven years have exceedingly endeared him to his congregation. Gentle, amiable, kind and courteous, with a heart full to overflowing with benevolence, with a charity which included in the wide circle of his affection all the lost world for whom the Redeemer died, always under the influence of the most kindly feeling for all men and the tenderest sympathy for the afflicted, he associated with the people as their spiritual father and guide. "He delighted in the Gospel; Christ crucified was his constant theme, and he loved especially to dwell in his preaching on the bright and cheering topics of Christianity. The mercy of God, the tender and kind invitations of the Saviour, the soothing consolations of religion and its glorious hopes, constituted the burden of his preaching ; and when set forth with great animation, the most moving pathos in an eloquent style of composition, aided by a delightful voice and fine manner, gave to his preaching a peculiar charm which all appreciated. "He dearly loved the liturgy of the Church, and as in its eloquent and holy strains he presented to God the prayers and praises of his people, he often wept. "Love to God and love to man dwelt in his bosom and pervaded his conversation and sermons. He could seldom speak of the dying love of Christ without tears; and, like the beloved apostle whom Jesus most loved, and whom he greatly resembled in character, the prevailing sentiment of this aged minister of Christ, during his latter years, was, "Little children, love one another." Oh, that his bereaved people may remember and obey this godly admonition!" The Chief Justice of the U.S. Supreme Court was actively engaged in the initial fundraising for the Monumental Church and was an active member of the church until his death. "At an early age he was graduated at West Point, and was commissioned in the army of the United States. Under the instruction of Dr. McIlvaine, chaplain at West Point, and afterwards Bishop of Ohio, his mind had been directed to the Church, and after a few months of service in the army, he resigned his commission to become a candidate for orders. In April, 1830 he was ordered Deacon by Bishop Moore, of Virginia, with whom he continued to serve for a time, as assistant minister of the Monumental Church, Richmond. In a little more than a year his health failed, and he visited Europe. In 1833 he setled at Columbia, Tennessee, and in 1838, at the age of thirty-two, he was called to the episcopate as Missionary Bishop or Arkansas, with provisional jurisdiction in Alabama, Mississippi, and the (then) Republic of Texas. In 1841 he was elected Bishop of Louisiana, and resigned his missionary jurisdiction." 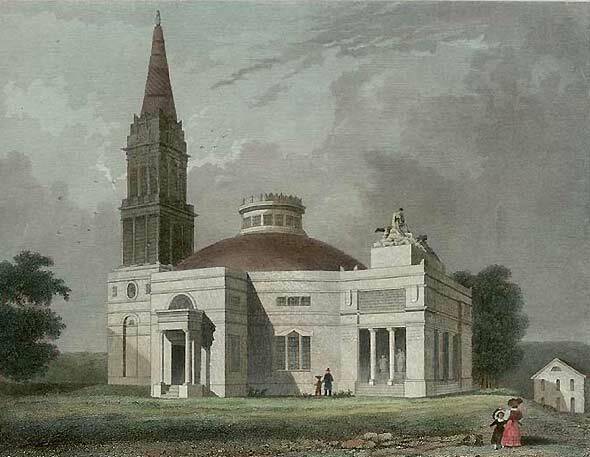 Bishop Dudley's remembrances of Monumental Church may be found in the Prefatory Letter to History and Reminiscences of the Monumental Church, Richmond, Va., from 1814 to 1878 by Geo. D. Fisher. Henry Lay became Missionary Bishop of Arkansas and the Indian Territory in 1846. Cornelius Walker became professor of ecclesiastical history and polity, and pulpit eloquence at the Theological Seminary of Virginia in 1845. Rev. Williams, D.D., became missionary bishop for China and Japan in 1855 and was consecrated in 1866. At the end of October, 1824, "Gen. LaFayette attended Divine service in Monumental Church, when an uncommonly large congregation attended, and a prayer was offered by the Right Rev. R. C. Moore, D. D., bishop of the diocese, for the happiness of himself and family" as noted by the Richmond Enquirer, Friday, Nov. 5, 1824. The Governors of Virginia who attended Monumental include: James Barbour, Wilson Cary Nicholas, James P. Preston, Thomas Mann Randolph, James Pleasants, John Tyler (the younger), William B. Giles, John Floyd, Littleton Waller Tazewell, Wyndham Robertson, David Campbell, Thomas Walker Gilmer, John M. Patton, John Rutherford, John M. Gregory and James McDowell. Edgar Allan Poe probably attended with his foster parents, Mr. and Mrs. John Allan. However, no records remain of his membership or confirmation. Unveiling the new monument October 7, 2005. "Take, gracious God, take my congregation into thy holy keeping; preserve them from sin, and let that mind that was in Christ Jesus be in them!"